Enjoy Part Sale 25% to 50% off on kid's garments from Smart Baby outlets. Offer valid at Abu Dhabi, Sharjah, Ajman, Ras Al Khaimah, Umm Al Quwain, Fujairah Smart Baby Stores. 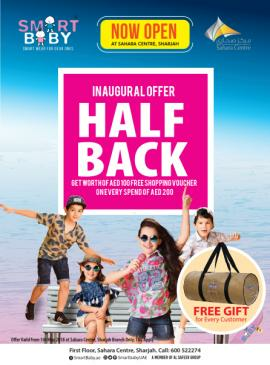 Smart Baby 1st Anniversary offer @ City Centre Sharjah. 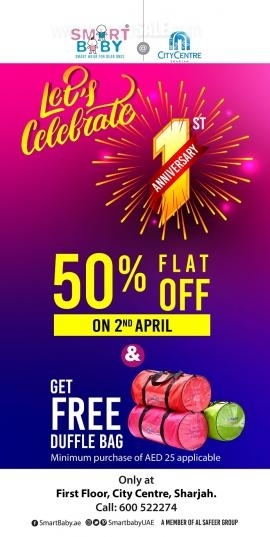 Offer valid for 1 day only - 2nd April 2019. 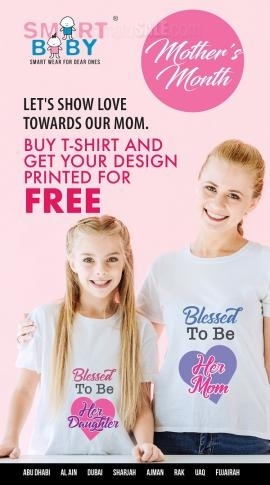 Smart Baby Mother's Day Promotion. Offer valid from 13th - 31st March 2019. Offer valid at all Smart Baby Store. Smart Baby - End of Season Sale. 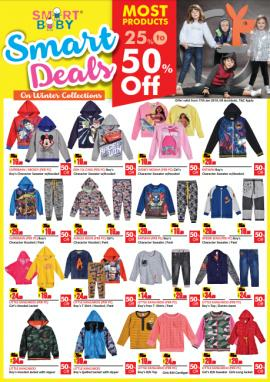 Flat 50% off on kid's winter collection. Offer valid from 7th to 16th February 2019. Offer valid in both online and instore. Final Sale. Flat 50% Off on big brands. Offer valid from 31st January to 2nd February 2019. From Selected Smart Baby Stores - City Centre Sharjah, City Centre Deira, Sahara Centre Sharjah, Burjuman Dubai, WAFI Dubai. Smart Baby Smart Deals. Offer valid from 17th January 2019 till stock lasts, T&C apply. Smart Baby Weekend Deal. 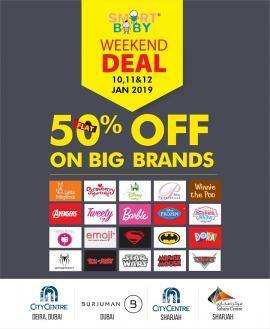 Flat 50% Off on big brands. Offer valid from 17th to 19th January 2019. From Selected Smart Baby Stores - City Centre Sharjah, City Centre Deira, Sahara Centre Sharjah, Burjuman Dubai. 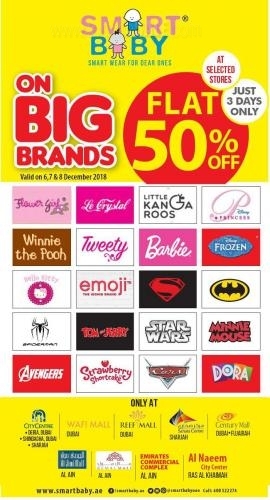 Smart Baby Big Brand Sale. Flat 50% Off on big brands. Offer valid from 10th to 12th January 2019. From Selected Smart Baby Stores - City Centre Sharjah, City Centre Deira, Sahara Centre Sharjah, Burjuman Dubai. Smart Baby Burjuman Inaugural offers. BIG BRAND. BIG SALE. Get flat 50% off sale on selected items. Avail biggest deal of the season on your favourite Big Brands from Smart Baby on 6,7 and 8th December from selected stores. Valid in - DUBAI : City Centre Deira, City Centre Shindaga, WAFI Mall, Reef Mall, Century Mall, Smart Baby Qusais. SHARJAH : City Centre Sharjah, Sahara Centre. RAS AL KHAIMAH : MySafeer Naeem Mall. FUJAIRAH : Century Mall. AL AIN : Smart Baby - Jimi Mall, Remal Mall, ECC Mall. Smart Baby Super Sale. 22 - 24 November 2018. Valid in all Smart Baby Dubai Branches. 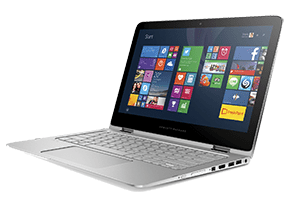 Smart Baby - Discount up to 50%. Offer valid at all Sharjah branches. Smart Baby Back to School offer. Valid till 12th September 2018. Available on Selected Stores - SHARJAH: Smart Baby - City Centre, Smart Baby - Sahara Centre, Smart Baby - Safeer Market Al Qasba, Smart Baby - Safeer Market King Faisal St., Smart Baby - Safeer Market Maliha, Smart Baby - MySafeer Al Qasimiya. AJMAN: Smart Baby - Safeer Hypermarket Mushairif, Smart Baby - MySafeer Al Ittihad Street. DUBAI: Smart Baby - Century Mall, Smart Baby - Arabian Centre. RAS AL KHAIMAH: Smart Baby - Al Naeem City Centre, Smart Baby - My Safeer Nakheel. FUJAIRAH: Smart Baby - Century Mall. 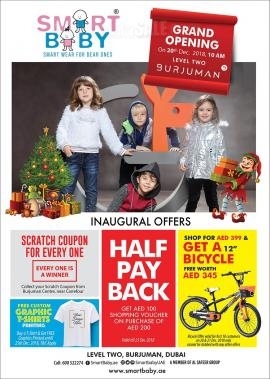 AL AIN: Smart Baby - Jimi Mall, Smart Baby - Remal Mall. Smart Baby - Inaugural offer. Half Back. Get AED 100 worth Gift Voucher on every purchase of AED 200 + Free gift on every purchase. Offer valid from 5th May 2018 at Sahara Centre, Sharjah branch only. T&C apply. 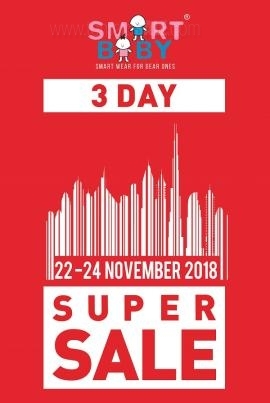 Get all information about latest Smart Baby offers, Smart Baby Dubai offers and promotions, Smart Baby Ajman deals, Smart Baby offers in UAE, Baby & Kids clothes, fashion offers, baby clothes offers, Baby Clothing, Infant Clothing, Kids Clothing, Boys Clothing, Girls Clothing, Strollers, Gifts and Smart Baby Sharjah promotions by browsing through TomatoSALE.